Be the first to share your favorite memory, photo or story of Lucas. This memorial page is dedicated for family, friends and future generations to celebrate the life of their loved one. 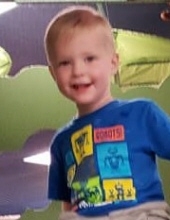 Lucas ‘Ryder’ Harrell-Auteri, 21 months of age, gained his angel wings on October 30th in Oklahoma City, OK.
A memorial service will be held Monday, November 5th at 11am at LifeChurch in Stillwater, with Jordan Weston officiating. Ryder will be laid to rest at Morris Heights Cemetery in Orlando, OK. Visitation will be at Trout Funeral Home of Perry, 1408 N. 7th Street, on Sunday, November 4, 2018 from 1:00 p.m. to 8:00 p.m. with the family meeting with friends from 2:00 p.m. to 4:00 p.m.
Ryder was born on January 26, 2017 to Parents Stephanie Harrell and Justin Auteri in Oklahoma City, OK.
Ryder loved giving hugs and kisses to his family and to Fancie, Jazz, Harley, and BooBoo. He enjoyed swinging under the apple tree and going for rides on the ‘tractor’ with his Father Justin and Papa Dan. He was content rocking in the rocking chair with Oomah singing in his ear. He seldom went anywhere without either Foxy or BearBear. He had a one of a kind personality and never met a stranger. He had a love for basketball and always wanted to be outside with his brothers and neighbor kids trying to shoot hoops with a ball as big as he was. He brought so much joy and so many laughs with his beautiful smile and bright blue eyes, his quarky attitude, and his funny facial expressions. He loved watching Paw Patrol, pillow fighting with the kids, playing peek-a-boo, running his cars through the house and playing catch. He also loved cuddling with Joe on the couch and using Momma as a jungle gym. ‘Lil Bub’ as called by his siblings will forever be missed and deeply loved. Emma will tell you that what she loves most is how cute he is and Brother Braydon says that he loves that ‘Lil Bub’ was cute and funny. Joshua’s most loved thing about brother was simply his presence. His smile and laugh lit up the room and always brought happiness and a calm to him when he came home. Survivors include his Mother Stephanie, Dad-in-love, Joseph, big Brothers Joshua and Braydon and big Sister Emma of the home, Father Justin Auteri, Paternal Grandparents Dan ‘Papa’ and Johnna ‘Oomah’ Hasenfratz of Stillwater, OK and Chuck Auteri of Utah, Aunt Katie “Fred” Auteri of Stillwater, OK, Maternal Great-Grandmother Jannie Kramer of Stillwater, OK, Great-Grandfather Harlan Bell of Pryor, OK, Grandparents Tony and Mellanie Patak of Orlando, OK, Uncles and Aunts, Terry and Marriya Wright of Stillwater, OK, David and Amanda Harrell of Glencoe, OK, Jarrod and Megan Harrell of Perry, OK, Dustin and Olivia Warden of Stillwater, OK, and Eli Patak of Orlando, OK, as well as numerous 1st and 2nd cousins. Ryder was preceded in death by Maternal Great-Great Grandmother Doris ‘Granny’ Bell, Great Grandparents Eugene ‘Beba’ Harrell and Leona ‘Mema’ Harrell, Grandfather David Harrell, Great Aunt Debbie Lorance, Cousins, Michael Dickenson Jr. and Cooper Stevens. Pallbearers will be Joshua Hermann, Braydon Fields, Tyrell Bolden, Xavier Fields and Anthony Harrell. Honorary Pallbearers will be TJ Wright, Dylan Wright, Connor Nemec, Riely Harrell, Devin Throckmorton, Kanon Harrell, Patrick McGuay, Hunter Warden and Jaxon Harrell. The family would like for you to share your memories of Ryder at www.troutperry.com. To send flowers or a remembrance gift to the family of Lucas Ryder Harrell-Auteri, please visit our Tribute Store. The family would like to greet friends at this time. 1917 N. Country Club Rd. "Email Address" would like to share the life celebration of Lucas Ryder Harrell-Auteri. Click on the "link" to go to share a favorite memory or leave a condolence message for the family.